The earlier Nintendo years were known for a bunch of games like Super Mario Bros. and Donkey Kong. The original entry in the Excite series - Excitebike - might not have had the same level of success as other games, but the retro dirtbike experience is still a fan favourite years later. With several versions of the game already available on existing Nintendo systems and even within other games, the latest issue of Famitsu has revealed Hamster will be bringing Arcade Archives VS. Excitebike to the Switch this fall. The title was previously released on the Wii U in 2015. VS. Excitebike appeared on the Famicom Disk System in Japan in 1988, and while the core game remains intact, there's also the ability to create custom tracks and race against friends. This latest release joins various other Arcade Archives entries such as VS. Super Mario Bros. Each of these releases typically includes online leaderboards to add replay value and make the experience more competitive. Are you looking forward to Excitebike arriving on the Switch eShop? Are you a fan of the original game? Tell us in the comments below. @JAPBOO Soon we'll have VS Excitebike with online leaderboards but no online play and Excitebike NES with online play but no online leaderboards. I'm super happy for this. One of my most beloved games. The reason I bought a diet bike before a car as a teen too. The reason i broke my leg the first time as well. Lol. Would a rerelease of Excitebike World Rally be too much to ask? That was fun to play and online sessions were a hoot. People who missed out on it can only stare at the Wii Shop page with no option to buy it while owners have only the offline modes. Come on, that would take an afternoon to port. Meh. Of all the games of that era that'd I'd like to play again. This one is pretty low on the list. Finally!!! I’ve been waiting for more of the VS. Nintendo titles since they’ve were announced last year!!! Still want VS. Balloon Fight though!!!!! @PhilKenSebben Then get the 3d Remake for the Nintendo 3DS. It is the same core game but with snazzy 3d graphics. Lot of fun! I hope at some point companies start porting over all the amazing wii ware titles that remain stuck in Wii Eshop limbo (like the amazing Rebirth Konami games). @phamster Way ahead of you, but my son owns that system now. Thanks tho! Why is everybody so down on this? It's one of my most wanted Disk System games! The original was fun enough, and this one adds some really cool features, like a proper way to create and save your tracks. But then again, still no Mr. Goemon... That's the one I would buy in less than a heartbeat. @OorWullie But Excitebike doesn't have a multiplayer mode (not even the turn based one like Super Mario Bros had) nor does VS Excitebike. I got this on the Wii U, but being the arcade Vs. Excitebike, I wonder if there's a difference from its NES counterpart, or if it's basically the same game only slightly remixed like Vs. Super Mario Bros.? Either way, I got NES Vs. Excitebike on Wii U and won't double dip unless something compels me. Wake me when Arcade Archives Donkey Kong Jr. drops or another forgotten Nintendo arcade game appears. @NintoRich If it's like all the other games, it's the arcade port. I still like this game though, even though it's missing the track editor and 2P vs mode. I actually thought of holding a contest for a free download of VS Excitebike as the reward a long time ago, but nothing's final yet. @MagnaRoader castlevania and contra rebirth stole so much of my time!! @kotag I know right? So darned good. 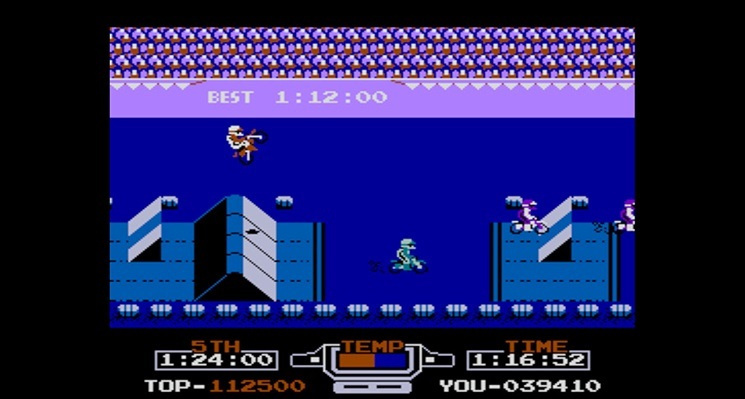 This is the arcade version of Vs. Excitebike, which means no in game music (though it does have music in the same places as the original NES cart) and no edit mode. @Angelic_Lapras_King I really want this aswell. I could also see a new Excitebike game that maybe has an upgrade system and a perspective shift when turning corners.